You wanted more power; now you have it. Meet Nitro Rustler, the bad boy on the block. It’s the fastest RTR (ready-to-run) nitro truck ever made! 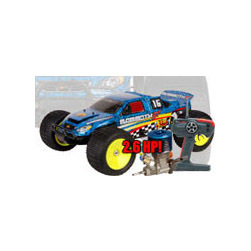 Nitro Rustler throws the rule book out the window with the insane horsepower of its 2.5cc, 2.5 h.p. race engine. It just might be too much power for a 1/10 scale truck, but that’s what you asked for! To handle the extra power, everything has been over-built to maximum specifications. 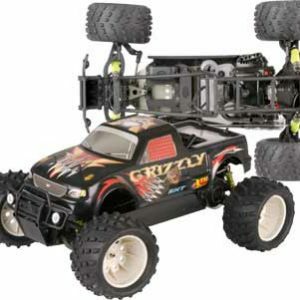 The transmission uses super heavy-duty gears and full ball bearings for high-rpm, high-power action. The faster top speeds required a strong disc brake to halt the beast. The rigid T-6 aluminum chassis, smoother Ultra Shocks™, and the legendary SRT racing suspension provide top-notch handling and control. The TRX 2.5cc, 2.5 h.p. engine features a machined aluminum head; grooved, oil-ring piston; high-flow porting; and big-bore carburetor. In response to an overwhelming request, the Nitro Rustler now also features the EZ-Start, one-button electric starting system. Nitro Rustler’s specially-tuned exhaust pipe extracts the maximum horsepower and rpms. 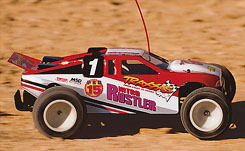 Nitro Rustlers are available professionally assembled and ready-to-run from the factory, with or without the Traxxas Top Qualifier™ radio system. Just add fuel and batteries to the ready-to-run, and you’re driving immediately. If you think you’re ready for the most punch ever packed into a single 1/10 scale truck, then Nitro Rustler is for you. Fully assembled, Ready-To-Run™, with TQ™ radio.